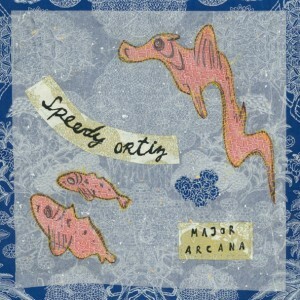 Speedy Ortiz – Major Arcana | NoCoda. What It Sounds Like: Disjointed indie garage guitar pop, full of fat-bellied riffs and chunky noise, all led by a Hayley Williams sound-alike. I don’t care if they take my legs. Don’t be thrown off by the Hayley Williams comment. I just love that intro to Tiger Tank. Just a thick, heavy bass paired up with a meaty guitar that gives way to a quirky indie pop jam. The simplicity that is Casper (1995), with its nonchalant and relaxed walks up and down the fret of the guitar, shows their diversification even further. I’ve mentioned only three songs off this record so far, but there is more than enough depth to dive into if you want a larger dose from the rest of these tracks. The lyrics that I’ve mentioned are probably the most simplistic off the record, so further poking, prodding, and analyzing is more than welcome. There’s no doubt that Sadie would teach her freshman students (that are only a couple years her junior) the same. From the squealing distortion of Cash Cab, to the slow-building Pioneer Spine, which takes a minimalistic, empty room approach that ends in a wall of woozy energy – you’re sure to be in for a new experience here. It’s fresh and inviting, while completely unstereotypical. By the time you’re halfway through the drunken and chaotic closer MKVI, you’re not gonna know what hit you – and painful or not – you’ll know that you’re enjoying every second of it.